Wow, 1000 reviews. It’s incredible to think that our unusual little book on emotions would win the hearts of so many people. Heartfelt thanks go out to each one of you who took the time to review us on Amazon, on Goodreads, at Barnes & Noble, Kobo, and other e-tailers. You might not realize it, but each one of these reviews is incredibly important. As writers, we all understand an idea can’t be copyrighted. That’s how it goes. And while in fiction the same idea can yield vastly different stories, this is not always the case when it comes to nonfiction. When Becca and I first started writing these thesaurus books, there wasn’t much out there that we could compare ourselves to because our list format made our descriptive resource somewhat of a hybrid: part tool, part book. Now? There’s quite a few description-focused writing books using lists (some similar to our topics here at WHW). And if you ran a search for titles, well, let’s just say you’d find more than a few with the word “Thesaurus” in them. This brings us back to the huge role reviews play and why we cherish each one so much. 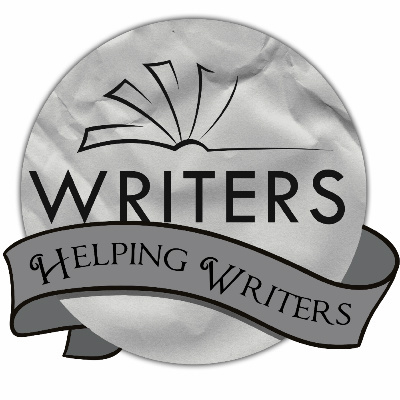 With each review, you’re helping our Writers Helping Writers brand of thesaurus books stand apart from all others. So THANK YOU. Becca and I are so lucky to have such great readers! Your incredible love and support is what drives us to create books that help writers in the ways they need most. And it wouldn’t be right to not give away a few Emotion Thesaurus Books, right? So in addition to the above, we’ll also give away 3 ebooks of the ET. 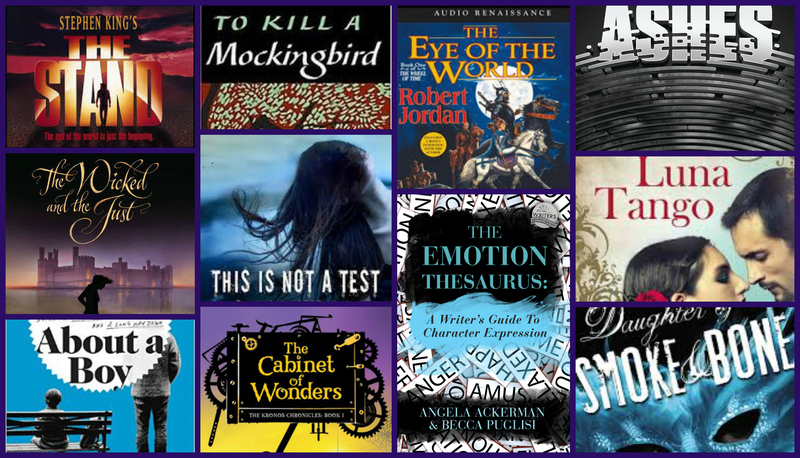 *Want to win one of these terrific e-reads? Just comment with your top 4 choices. We’ll use our friend Random.org to select winners. Contest closes midnight EST Friday January 15th, and winners will be announced Saturday, January 16th. As always, social sharing is appreciated but never a requirement to enter. GIVEAWAY IS NOW CLOSED. THANKS SO MUCH FOR ALL YOUR COMMENTS! *Must be 18, no purchase necessary, open to all unless prohibited by law. For the full legal rules and disclaimers, go here. What’s your favorite book in one of our categories? Let us know so we can check it out! Happy reading, and good luck! This entry was posted in Sales Numbers & Helpful Data, Uncategorized. Bookmark the permalink. Another big King fan here – I do a podcast with Hans Lilja – over at the Lilja’s Library called, simply enough, The Stephen King Podcast. It shames me to say I’ve never read – To Kill A Mockingbird – so mark me down for that one. Onwards and upwards – best wishes with your future endeavours! I’m not surprised at all your successes. Building a house at the moment, will sign up for your new site and get back to writing as quick as I get moved in. Love you two and I’m always interested to see what interests you. The Cabinet of Wonders (great title) sounds irresistible. I often like YA; sign me up for The Wicked and the Just. Of course, I’ve seen About A Boy, the movie, but reading book versions after the movie are always an entirely different experience and help you focus on why it works. Daughters of Smoke and Bone – I don’t always love fantasy, but since you like it, I probably will. Thanks for being your charming, hard-working selves. Congratulations! Well-deserved. I’ve used and recommended The Emotion Thesaurus many times over. I have a few books on my shelf that i have had FOREVER and still need to read. I think that’s a writer thing, lol. Congratulations on hitting your milestone! That’s wonderful! Congratulations on 1000 reviews. You’re books have helped me so much and continue to do so. oops on the typo I meant ‘your books’ not ‘you’re books’. lol. 1) To Kill A Mockingbird (#1 book *and* movie). And, a book that may grip you from start to finish: Wizard’s First Rule by Terry Goodkind. I’ve read that one Rob, and I did enjoy the series as far as I got. I think I have an image of Zed on the rock naked burned into my imaginary retinas, haha! Always love what you gals are up to. Your books are amazing, a super help to me, and I know, many others. What you’ve achieved is remarkable, a true legacy. Thank you! 2. YA book – The Book Thief Author Zusak, Markus. Thanks so much for the kind words, Carollyne. 🙂 Wishing you good luck! In the category of Romance, I love Nora Roberts and her novel, Midnight Bayou. I just happened across your website last week and joined right away! Looking forward to spending some time in your site, and minds! Also, congrats on your Amazon 1000! Congratulations on your reviews! I need to go see if I have left one. I have the Negative and Positive Trait books as well as The Emotional Thesaurus. I think I will use the Setting Thesaurus even more! I completely agree with the Stand and To Kill a Mockingbird! I will have to check out some of the others on your list. Aw, thanks so much Donna! Congratulations on the success of the Emotion Thesaurus. In fact, the one that I purchased. I love everyone posting their favorites–it gives me a good place to start a new reading list! Mille fois BRAVO Becca et Angela et MERCI de partager avec les écrivains du monde entier. OUPS! sorry, my emotions are coming out of me in my mother tongue… I started my “writing life” in 2011 and found the Emotion Thesaurus in december 2012. Since then, it is my companion book. I will publish my first Picture book next summer… fingers crossed!!! Favorite books: 1. Emotion Thesaurus; 2. Emotion Thesaurus; 3. Em… non, let’s try another one: About a boy: because it made Becca laugh out loud – love laughing! ; 4. Daughter of Smoke and Bone: love the title! You are the best Monique! My French is rusty, mais je sais un peu Francais lol. Congrats on reaching a momentous milestone! My copy of The Emotion Thesaurus sits on my desk just within reach–and I reach often! Thanks for the great resources you’ve provided! Can’t wait to see what you do next! Thanks Amy–and good luck in the draw! I cannot thank you ladies enough for all the hard work you do. You have inspired me, helped me and kept me going so much over the past couple of years…I have always looked forward to each of your visits in my email and on your site(s). Thank you. One I haven’t read yet but sounds fascinating? 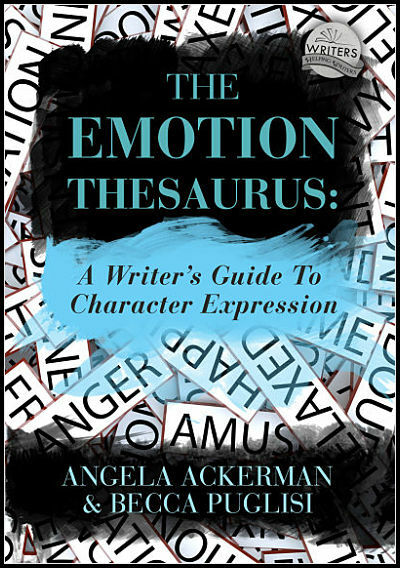 Hi Angela, you know I’m one of your big fans and love to recommend the Emotion Thesaurus to other writers! I love that, as your celebration, you and Becca are giving back…very much the Angela I know. Wow! My 4 favorited from your list have to be To Kill a Mockingbird, The Cabinet of Wonders, The Wicked and the Just, and This is Not a Test! Congrats on the 1000 reviews!! We’d love to see you at one of our Crit group meets for “old times’ sake’ too.? Yes that would be great–or even a lunch get together–I miss you guys! Love to read. However, to be honest, the ET books would be helpful. I am currently developing with members of my writing group a short fiction e-book. Our original writing exercise theme got a steroidal injection from a previous meeting visitor’s comment, “The writing group talks a lot about writing, but nobody does any real writing!” Ouch! Suddenly our simple writing exercise grew into all of us writing short stories to be included in an e-book anthology. So far it has been a fun informative project with plans to publish in April 2016. Patrick, what a great project. Congrats! I think we learn a lot by going through the steps of publishing and I know this will be a good experience for your group! Thanks for sharing your favorites, Michael! Wow, congrats on the 1,000 reviews! That’s really amazing! I was at my romance critique group and one member pulled out a paperback of The Emotions Thesaurus and raved about how helpful it was. I use it online. I have too many favorite books. Bookaholic here. So kind, thank you Tracy! Once having discovered your website and The Emotion Thesaurus (purchased), I’ve been back over and over and over again. As a newby writer (post-retirement), I’m stretched way out of my comfort zone, and every tip and explanation helps me so much! 2. Any fantasy book: Daughter of Smoke & Bone sounds very interesting to me. 4. and then, Luna Tango – because I like to read books from writers in other countries. Cheers to the two of you – I’m so impressed at what you are doing in the writers’ world! Very glad the site is a good home for you, Celia! *The cabinet of wonders- because I want to at some point write an Ya/Mg steampunk and this sounds fantabulous and would be great to study the genre, I think. *daughter of smoke and bones, because I have once met Laini Taylor and because the series seems awesome. And to kill a mockingbird- because it’s a classic, and I firmly believe one should study the classics. Hi Nina, thanks for the congrats and good luck! That’s fantastic! I’m so glad your books are resonating with people. I often recommend The Emotion Thesaurus to other writers. 🙂 The Hunger Games is one of my top favorite banned books. Top favorite books, period. (smiling) And I’d love to be entered for one of your other ET books. Loved the Hunger Games–I use it to teach all the time! Congratulations on the reviews, but I’m not surprised. Yes, there are a load of similar books out there now, and being a writer-help book junkie, I have most of them. No comparison. Don’t think I left a review at Amazon. Going there now – so make that 1001! It seems you are always sharing your successes with us in such generous ways. If I ever have a writing success, I’ll send you a box of chocolates. I can’t write a comment without thanking you again for ONE STOP. Waiting impatiently for your February addition!! Let it grow, let it grow, let it grow…..
Congratulations on reaching this milestone!!!! Your books are very helpful and I’m excited about your upcoming books. Theres so many great books on the list. Glad there is a Stephen King book and the first on the list too. He’s brilliant at gaining a scare and knows how to get a reaction out of his readers. I’d have to choose About a Boy and perhaps To Kill a Mockingbird. Shamed to admit that I still havent got round to the classics. Will have to start reading. Congratulations on reaching 1000 reviews! That’s fantastic in itself, but it will also set you apart as the original when people copy the idea. Hmm…what a great contest! I’m a long-time fan of your blog site, and I’d love one of your Emotion Thesaurus Books. For number four, About A Boy sounds wonderful. I could always use a good chuckle! Congratulations!!! Well deserved. Please don’t enter me in the giveaway since I already have too many books to read, but I did want to stop in and say YEAH to you both. By the way, I LOVE ONE STOP FOR WRITERS. Have I told you that lately?? You may have said it once or twice, but we never get tired of hearing it 😉 Thanks for stopping by!